India Profile now offers well-designed tour itineraries for Uttaranchal in India. A fine mix of scenic delights and numerous tourist attractions, Uttaranchal is indeed an experience you will always cherish with great delight for the rest of your lives. Our tour itineraries for Uttaranchal have been designed in such a manner that they can easily be customized to suit various needs. Moreover, the India Profile Uttaranchal tour itineraries encompass the best of what this beauteous state has to offer. As a result, you can rest assured of a fine tour to speak of with great delight. 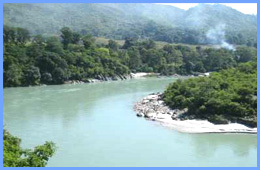 Besides its magical natural beauty, Uttaranchal is also home to some famous pilgrimage sites. And our tour itineraries for Uttaranchal ensure that you visit each and every sacred site in the state. Besides, you also get to stay in some of the finest hotels the state of Uttaranchal can offer. If you are planning on a tour to Uttaranchal, do have a look at the packages we have to offer. Besides their reasonable price tags, the itineraries also give you many delightful moments to remember for life. India Profile offers online bookings for Tours Itineraries for Uttaranchal, India.